My friend Berian found a couple of mosaics in Terekty 2016, and I immediately made an hour-long pilgrimage from the center of Almaty to go look for them in the former collective farm northwest of town. Terekty is an outlying village that only recently has been incorporated into Almaty’s Alatau district, and many still know it by its Soviet name KazMIS. It’s a quiet neighborhood with a leafy main street and a neglected little square, where the only new building is a toikhana, a banquet hall for Kazakh weddings. Next to the toikhana is an abandoned building that once housed the village department store and a bakery. On that day in 2016, I found two mosaics clinging to life on this shell of a building. The first one was a long frieze above the former entrance, made of flat glossy ceramic tiles, depicting the various goods that were once on sale at the department store: children’s toys, musical instruments, clothing and cakes. The second mosaic was much larger and made of the same materials, and it showed a tractor driver, a milkmaid, and farm administrator. I’m sad to say that the second mosaic has since been destroyed. When I first laid eyes on these mosaics in 2016, I was immediately concerned for their future. The building’s windows were broken, the interior ransacked and empty, and it was clear that any future buyer was likely to tear the building down. As in most such cases, the mosaics would be thoughtlessly tossed out. I desperately tried to find the owner of the building to argue that the mosaics should be saved. Asking around the neighborhood was fruitless - people professed ignorance, or were cagey about giving out the owner’s contact information. Our luck changed, we thought, when we finally tracked down the akim of the neighborhood, an unelected official who was tasked with overseeing the safety and order of Terekty. He would surely to be able to help, we thought, but then again, it was clear that his management of the neighborhood left something to be desired. 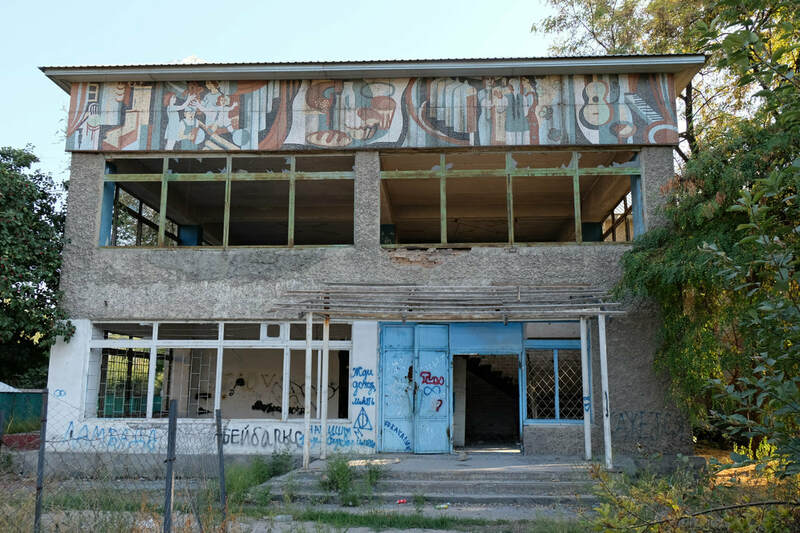 Municipal statutes state that owners of derelict structures like the Terekty store should be fined and instructed to either clean up their property or tear down their buildings. The akim seemed ignorant of any such responsibility, claimed to not know the owner, yet said he would see what he could do. After two decades of neglect, renovation work had suddenly begun at the Terekty store, and hired workers had roughly broken the larger mosaic’s concrete panels off the building (“Where is the rubble?” I asked, “maybe we can put it back together.” “They won’t say,” came Kuanysh’s reply). I was upset, but one mosaic was still intact, the long horizontal piece above the front door. Maybe it could still be saved? This is where I owe a word of gratitude to Mark Zuckerberg. I took to my Facebook page and blasted off a stunned call for help. The building’s owner, finally reached by the foreman’s phone, had told us that the second mosaic was coming down too, and we were free to take it, but only if we had our own team and equipment to dismantle the panels. In just a few hours, with the help of Vlast.kz journalist-mosaic-enthusiast-superstar Svetlana Romashkina, we found a local philanthropist who was keen to help. Eduard Kazaryan, a well-known local artist and mosaicist, was sent out to assess the scene. Just when it was agreed that the second mosaic would be saved, there was a surprise twist - the owner had called back and said that now he wanted to keep the mosaic for himself, and it would remain just where it was. A bitter victory, but something we were eager to call a win.